Due to various reasons Qadianism is again drawing the attention of the elite and the layman alike in various parts of the world. In India, too. a good deal is being said and written about ii these days. 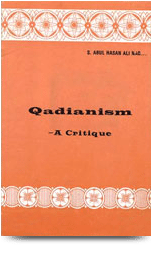 But, unfortunately, most of it 1s based on faulty and one-sided information The problem of Qadianism has assumed great importance not only for the neighboring country of Pakistan but for the entire Muslim Millat. The need was, therefore, felt for an objective study of the fundamental beliefs, practices and historical background of the new faith.